Is “pulling on the same end of the rope” a common phrase? I read an article a few years ago about Joe Maddon, manager of the World Champion Chicago Cubs, talking about it as if everyone knew what he meant. I didn’t. 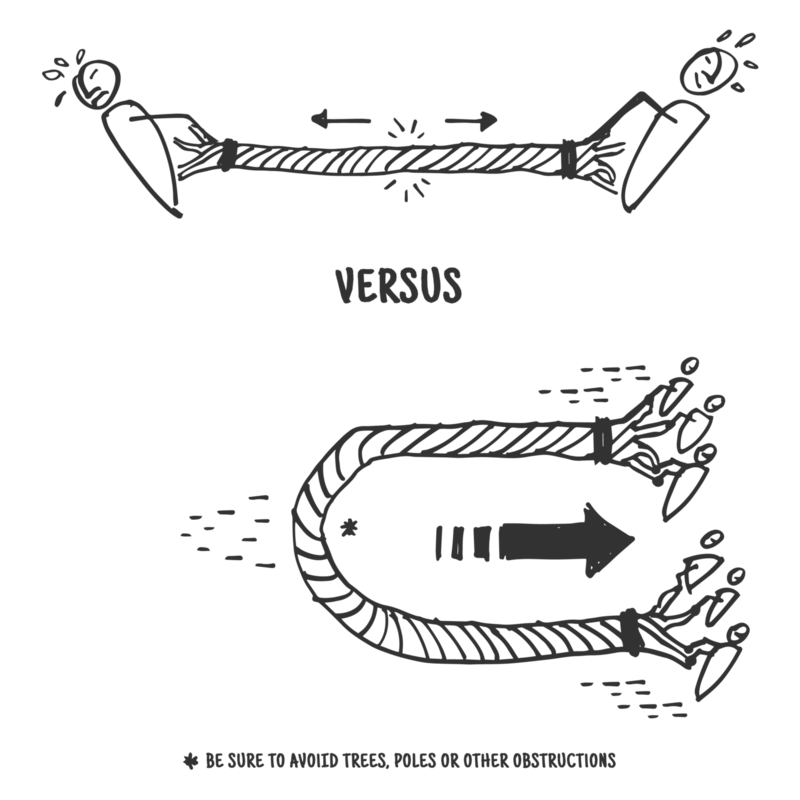 The basic idea is that if you have two people pulling on opposite ends of a rope in different directions, you’re never going to get anywhere. But if both people are pulling their ends in the same direction, you can do anything. What Joe Maddon glosses over in his analogy is that while having a shared vision and understanding about what you’re doing and why is essential, so is having the right team — one built on synergy. Synergy is not just positive results or teamwork or alignment* (nor is it the boardroom gesture of splayed fingers being interwoven). Synergy is the idea that the whole is greater than the sum of its parts. True synergy, different from those other terms, is the result of a variety of skillsets, points-of-view and expertise coming together to achieve the best results. At the beginning of my career, I used to beat myself up that I couldn’t be great at everything. And when I tried to be good at everything and do it all myself, the results were never that great. Now I know that better results can be found by working with a project management maestro and an engineering ninja and a bunch of people who are the best at the different aspects of making a project successful, and who work together well — synergistically. That synergistic mindset is a huge part of how we work with the clients we partner with. Internally on the client side, synergy means a diverse team: different backgrounds, pathways, skillsets, and mindset. But it’s the same externally between the client team and us as consultants. We are all good at something and not good at other things. I may be the king of problem solving (pun intended), but I rely on others for a ton of things like manufacturing, bringing products to market, website coding, etc. “Same end” means client and consultant have a commitment to a shared vision and we’re working for the same thing. “Synergy” means you hire us because what we bring to the table complements what you have internally. Working this way means that the best of all sides is brought together, making for truly successful outcomes. And your success is how we measure our success. *Remind me to tell you about the difference between alignment/agreement sometime.